Start with a basic T-shirt pattern like the one pictured here. You may already have a favourite pattern, or your own knit block - feel free to use that. 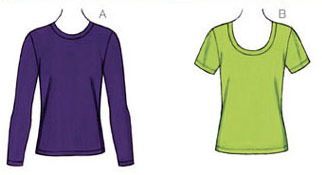 If not, McCall's 6964 or Kwik Sew 3766 are good options. You will start by learning how to alter your pattern to create the flattering cowl neck drape. How much drape will be up to you. Long sleeves, short sleeves or no sleeves - your choice. Once you start construction there will be lots of tips for working with tricky knit fabric. Size 70/10 Ball Point needle OR Size 75/11 Stretch needle. Ball point needles tend to work best with knit jersey. The Sew-Along will start on 8th February 2016 and run for six days with a new set of instructions every second day. Instructions will be posted on this blog. Join the AUSSEW Along Facebook Group to share with and learn from other Sew-Along participants. It's a closed group, so you will need to request an invitation to join if you have not already done so. Or you may prefer to work on your own without joining the group - that's OK too. An overlocker is ideal for working with knits but if you don't have one don't rush out and buy one (unless you really want to). Seam and hemming options will be given for both overlocker and sewing machine.